This card is a "step-up" from the previously posted "Simple But Elegant Everyday Card" sample posted on May 21, 2008: http://heatherporto.blogspot.com/search/label/STAMPSET-Baroque%20Motifs. Martha Stewart scalloped, floral border punch. I used this one since Stampin' Up! had not yet come out with their new scallop punch to be released Fall/Winter 2008. Stamp large swirl in base ink color (River Rock in traditional card). For small flowers use Rock-n-Roll technique: Stamp image in base color, Blush Blossom, then roll the edges of the stamp in the darker ink, River Rock. Then stamp on cardstock. Repeat as necessary. Pierce large flowers with handheld punch or piercing tool. Tape Ginger Blossom Designer Series Paper scrap (2" x 5-1/2") to the inside of the card, bottom. 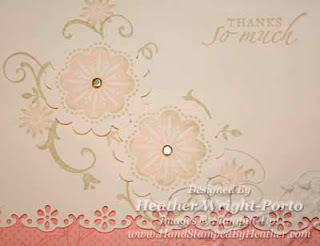 Use Scallop Border Punch to create the scalloped edge border on the bottom of the card front.